GET THE FREE LEARNING ABOUT TREES SCAVENGER HUNT! 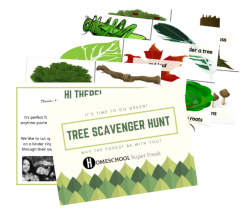 This fun tree scavenger hunt is perfect for nature hikes, park days, and even Earth Day and Arbor Day studies! Homeschool Super Freak would also love to add you to our •FREE PRINTABLES GROUP• where you get regular printables, freebies, activity ideas, and other awesome and fun educational info! Be sure to click on the first checkbox (under SELECT ONE) if you want to be added to our group! Complete the information, select your option, click on the permissions check box, and then click on the SEND ME THE PRINTABLE button! YES! Send me the FREE PRINTABLE and sign me up for more awesome info+printables+more! (Signing up is one way you can support us and help us continue to bring you awesome freebies and info!) NO! I don't need awesome stuff in my life and I'm not interested in supporting. Just send me the free printable. Homeschool Super Freak will use the information you provide on this form to be in touch with you and to provide the free download and/or updates. Selecting one of the buttons above gives us permission to send you the download and/or keep in touch with you!